In the middle of the 80, Saab was on the big leap. In Stallbacka the new R & D complex was built, 1986 the laboratories were ready to move into. Finally, the brand had its own modern wind and climate tunnel, acoustic laboratories and the latest computer technology. 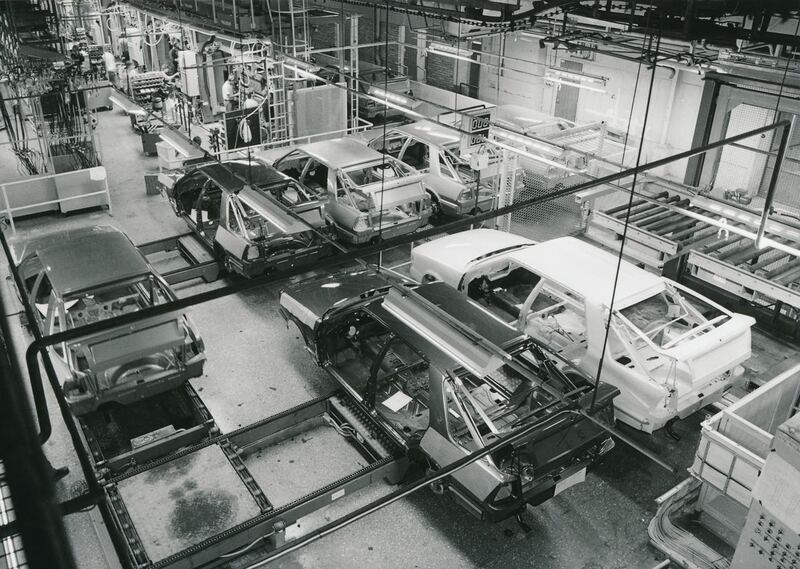 The Saab car department mutated into a high-tech forge. Fans, who were 2015 to the festival in Trollhättan, could visit the rooms. They still breathe the spirit of the exciting 80 and 90 years that should shape the evolution of the brand. Saab high-tech of the 80er. JAS 39 Gripen and 9000 CC. Image: Saab Automobile AB. 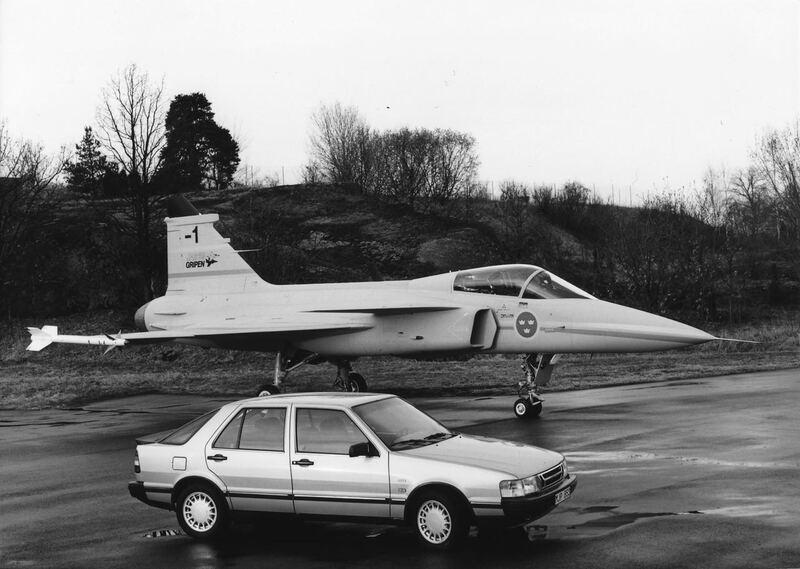 The Saab 9000 was considered an avant-garde high-tech vehicle from Sweden, the production grew from year to year and reached 1988 with 52.199 units an all-time high. Saab Turbotechnik was considered a leader, albeit expensive, as environmentally friendly and low-consumption vehicles. A Saab 9000 Turbo with 175 PS won the consumption test of the auto newspaper (12 / 86) against Ford Scorpio 2.8i, Mercedes 260E, Lancia theme, Renault 25, Opel Senator, Peugeot 505, BMW 525i and Volvo 760. The smaller 9000i relegated the Ford Scorpio, Audi 86, Mercedes 100E, Opel Senator and BMW 230i to the test of the car's image in May 525. Everything was fantastic, but Saab wanted more. Saab Vs. Competitors. Autobild 1986. Comparison test Autobild May 86. Saab is in front. In the 80 years, turbo engines were basically not durable, but in Trollhättan Olle Granlund was convinced of the stability of the design. The engines and manual transmission in the 9000 can be considered oversized, the big Saab is unbreakable, and as long as the engine and its gear find a drop of oil anywhere, they will run too. Good conditions, because the Talladega Superspeedway in Alabama had a challenge in itself. Mercedes had tried the record run with the 190 2.3 16 and had left when, after 50.000 kilometers, only one of the 3 sedans ran. Audi came to the track after Mercedes. The turbos from Ingolstadt failed on the oval in Alabama. Audi ended the nightmare, grabbed together, and the Swedes arrived. The story is well known and part of the Saab saga. 3 Turbo sedans, brought by representatives of the Motorsport Authority in the production state of the tape. 31 drivers, a maximum of 85 kilograms of spare parts per car were allowed to be carried. The Talladega Long Run of the Saab Turbo starts at the 7. October. After 5 minutes, the first record for 10 kilometers at a standstill. And that should only be the prelude. Within 24 hours Saab 13 won international records! 30 years later. Talladega number 1 is still a star. With a film crew from France. All 20.000 kilometers rolled the Saabs to the scheduled "inspection" in the pits. New oil, new oil filter and fresh spark plugs, that's all you need. The fastest inspection is said to have only needed 2 minutes and 18 seconds. Saab is fantastic and the turbos eat kilometers with high precision day and night. After 20 days the time has come. The fastest Saab 9000 Turbo has claimed the coveted 100.000 mileage record with an average speed of 213.229 kilometers, and all 3 vehicles can easily ride the distance. Saab has impressively demonstrated the quality of its vehicles, and in the 80 years one innovation chases the next. 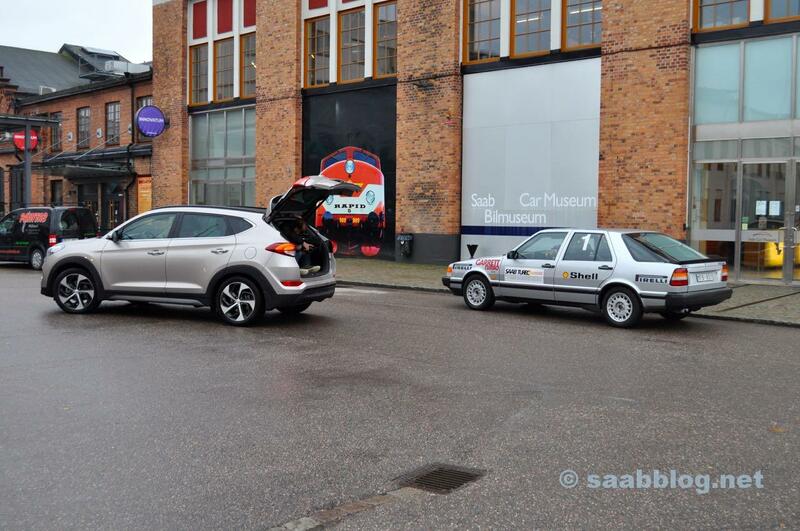 Never before and never after will Saab show so many innovations as in the life cycle of the Saab 9000. And the Swedes are doing everything right at this time. Facelifting - the art of keeping the vehicle always desirable - is high on the list. 1985 brings Saab the revolutionary direct ignition. The system dispenses with moving parts, thus minimizing the sources of error. The ignition voltage increases by 60%, the spark is 20 times faster than conventional systems. At the same time, Trollhättan is one of the first manufacturers to install the belt tensioner in the 9000. The following year, the 9000i 16 also appears, with a 80 valve engine that was considered a high-tech in the 16 years. The 1988 CD in Nice will be presented to 9000 with great effort, the exhaust control will be improved with a heated lambda probe, airbags for the driver will be introduced, and a traction control system will be introduced. 1990 is the 2.3 liter engine with balancer shafts, and Saab promises customers the smoothness of an 6 cylinder. The promise is not redeemed at 100%, very sophisticated is the 2.3 anyway, also eliminates Saab with the mildly charged Softturbo models turbo lag. Saab Turbo engines are constantly being cultivated, their acceptance is rising and rising, and the flood of innovation of 1.400 engineers seems to know no bounds. Saab is a leader in turbo technology and will prove to the world that you build the most environmentally friendly engines. The design department stands in strange contrast to the high-tech atmosphere at Saab. The engineers have the best computers and the most modern laboratories. The VAX 8800 and VAX11 / 785 are directly with the Cray 1 connected to the Aerospace Division in Linköping. At the same time, the design team around Björn Envall works in a building on the factory site that could be called a barn. Just big enough to set up a 1: 1 model, and with a balcony so you can see the design from all angles. The 80er. Saab is a high-tech brand. Envall was never happy with the design of the first Saab 9000 generation, today known as 9000 CC and 9000 CD. The original lines came from ItalDesign, Envall could only bring in detail areas. But Envall's great hour comes with the second generation of the great Saab. The 9000 CS will be the last model to be designed without specifications from the US in Trollhättan. Just as the 9000 was the only modern Saab where Saab was allowed to do what it wanted. Although Envall would say this publicly later, at a distance of around two decades. But it's the truth, because the Saab car division has meanwhile drifted into the loss zone again with high investments. Negotiations with Ford failed, in March 1990, the passenger car division was spun off from the Saab Scania Group. GM took over 50% of the shares, and decisions were made that would significantly affect the life cycle of the Saab 9000. What's next with the Saab 9000 saga? Envall gives the world a wedge. Opportunities are not used, the competition has caught up. And the 9000 lives longer than planned. Why? All in the next part. Saab 9000. The first Tech Saab. We thank you Saab archive by Wolfgang Schmel for the press photos provided. 8 thoughts too "Saab 9000. The car from the high-tech forge." History ...., As always written enthralling and highly interesting to read! The virus remains ... even if the SAABs get older and older. Great written. And as always, this topic grabs me more (SAAB) than the other (NEVS). Inspection in 00: 02: 18? Wow! This results in a workshop rate of 85, - € / h maintenance costs of 3,26 € plus material and VAT. Has anyone ever looked, whether the blog since the launch of his read-worthy and enthralling series of articles on the 9000 its prices has continued to drive up? The articles write the 9000 at least back in the interest. Because there is not much that could drive you up. The market is almost empty as far as good and well-kept vehicles are concerned. Before 4 or 5 years, the selection was still great. Who bought then did everything right. ... such was one of us in the family, the "entry-level drug" (as a replacement of the 528i)! ... and unfortunately I'm still completely dependent on it! Just, the fact today; Audi and MB play in the Champions League and unfortunately Saab is dead. It's the same with Lancia, my second passion next to Saab. What good is the 6 World Rally Championship title in a row today? Lancia is dead too. It is becoming increasingly difficult and of course more expensive to keep the great cars from Trollhättan and Turin alive. That's right. But it's fun to drive SAAB and the modern cars are just plain boring. Better an old SAAB, even if it makes trouble.